How long would it take to translate all the world's web content into 50 languages? Even if all of the translators in the world worked around the clock, with the current growth rate of content being created online and the sheer amount of data on the web, it would take hundreds of years to make even a small dent. Today, we're happy to announce a new website translator gadget powered by Google Translate that enables you to make your site's content available in 51 languages. Now, when people visit your page, if their language (as determined by their browser settings) is different than the language of your page, they'll be prompted to automatically translate the page into their own language. If the visitor's language is the same as the language of your page, no translation banner will appear. 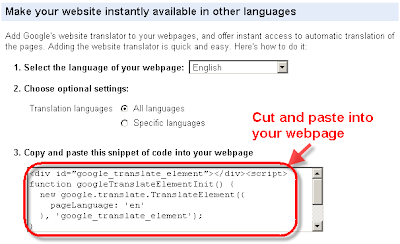 After clicking the Translate button, the automatic translations are shown directly on your page. It's easy to install — all you have to do is cut and paste a short snippet into your webpage to increase the global reach of your blog or website. Automatic translation is convenient and helps people get a quick gist of the page. However, it's not a perfect substitute for the art of professional translation. Today happens to be International Translation Day, and we'd like to take the opportunity to celebrate the contributions of translators all over the world. These translators play an essential role in enabling global communication, and with the rapid growth and ease of access to digital content, the need for them is greater than ever. We hope that professional translators, along with translation tools such as Google Translator Toolkit and this Translate gadget, will continue to help make the world's content more accessible to everyone. on the Official Google Blog that enable users to get to the information they want faster. Both features provide additional links in the result block, which allow users to jump directly to parts of a larger page. This is useful when a user has a specific interest in mind that is almost entirely covered in a single section of a page. Now they can navigate directly to the relevant section instead of scrolling through the page looking for their information. We generate these deep links completely algorithmically, based on page structure, so they could be displayed for any site (and of course money isn't involved in any way, so you can't pay to get these links). There are a few things you can do to increase the chances that they might appear on your pages. First, ensure that long, multi-topic pages on your site are well-structured and broken into distinct logical sections. Second, ensure that each section has an associated anchor with a descriptive name (i.e., not just "Section 2.1"), and that your page includes a "table of contents" which links to the individual anchors. The new in-snippet links only appear for relevant queries, so you won't see it on the results all the time — only when we think that a link to a section would be highly useful for a particular query. has launched a Site Clinic especially for the Spanish-speaking market. We're offering to analyze a series of websites in order to share some best practices with our community using real web sites. The plan is to offer constructive advice on accessibility and improvements that can lead to better visibility in Google's search results. During this month, we will be receiving submissions from any legitimate website, but it must be primarily in Spanish. So before you submit your site, please visit the original post and if you want to participate fill out the form as soon as possible, because we will only be selecting 3-5 websites from the first 200 submitted for this Site Clinic, so don't miss out! 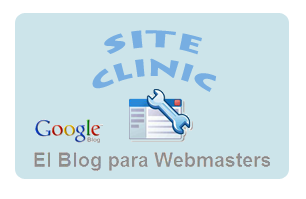 The Google Webmaster Central blog in Spanish has launched a Site Clinic especially for the Spanish-speaking market. We're offering to analyze a series of websites in order to share some best practices with our community using real web sites. The plan is to offer constructive advice on accessibility and improvements that can lead to better visibility in Google's search results. Recommendations for webmaster friendly freehosts. Webmaster Tools provides your users with detailed reports about their website's visibility in Google. Before we can grant your users access, we need to verify that they own their particular websites. Verifying ownership of a site in Webmaster Tools can be done using a custom HTML file, a meta tag, or seamless integration in your system via Google Services for Websites. Other website management suites such as Yahoo! Site Explorer and Bing Webmaster Tools may use similar verification methods; we recommend making sure your users can access each of these suites. Choose a unique directory or hostname for each user. Webmaster Tools verifies websites based on a single URL, but assumes that users should be able to see data for all URLs 'beneath' this URL in the site URL hierarchy. See our article on verifying subdomains and subdirectories for more information. Beyond Webmaster Tools, many automated systems on the web--such as search engines or aggregators--expect websites to be structured in this way, and by doing so you'll be making it easier for those systems to find and organize your content. Set useful and descriptive page titles. Let users set their own titles, or automatically set the pages on your users' websites to be descriptive of the content on that page. For example, all of the user page titles should not be "Blogger: Create your free blog". Similarly, if a user's website has more than one page with different content, they should not all have the same title: "User XYZ's Homepage". Allow the addition of tags to a page. Certain meta tags are reasonably useful for search engines and users may want to control them. These include tags with the name attribute of "robots", "description", "googlebot", "slurp", or "msnbot". Click on the specific name attributes to learn more about what these tags do. Allow your users to use third-party analytics packages such as Google Analytics. Help your users move around. Tastes change. Someone on your service might want to change their account name or even move to another site altogether. Help them by allowing them to access their own data and by letting them tell search engines when they move part or all of their site via the use of 301 redirect destinations. Similarly, if users want to remove a page/site instead of moving it, please return a 404 HTTP response code so that search engines will know that the page/site is no longer around. This allows users to use the urgent URL removal tool (if necessary), and makes sure that these pages drop out of search results as soon as possible. Help search engines find the good content from your users. Search engines continue to crawl more and more of the web. Help our crawlers find the best content across your site. Allow us to crawl users' content, including media like user-uploaded images. Help us find users' content using XML Sitemaps. Help us to steer clear of duplicate versions of the same content so we can find more of the good stuff your users are creating by creating only one URL for each piece of content when possible, and by specifying your canonical URLs when not. If you're hosting blogs, create RSS feeds that we can discover in Google Blog Search. If your site is down or showing errors, please return 5xx response codes. This helps us avoid indexing lots of "We'll be right back" pages by letting crawlers know that the content is temporarily unavailable. Can you think of any other best practices that you would recommend for sites that host users' data or pages? Most of the recommendations we've made in the past are for individual webmasters running their own websites. We thought we'd offer up some best practices for websites that allow users to create their own websites or host users' data, like Blogger or Google Sites. This class of websites is often referred to as freehosts, although these recommendations apply to certain "non-free" providers as well. Make sure your users can verify their website in website management suites such as Google's Webmaster Tools. So, check out Facebook Share and RDFa and help Google find your videos! Have you ever wondered how to increase the chances of your videos appearing in Google's results? Over the last year, the Video Search team has been working hard to improve our index of video on the Web. Today, we're beginning the first in a series of posts to explain some best practices for sites hosting video content. ", I heard plenty of questions regarding News Search from esteemed members of the press, such as The Stranger, The Seattle Times and Seattle Weekly. After careful note-taking throughout our conversations, the News team and I compiled this presentation to provide background and FAQs for all publishers interested in Google News Search. Would adding a city name to my paper—for example, changing our name from "The Times" to "The San Francisco Bay Area Times"—help me target my local audience in News Search? No, this won't help News rankings. We extract geography and location information from the article itself (see video). Changing your name to include relevant keywords or adding a local address in your footer won't help you target a specific audience in our News rankings. What happens if I accidentally include URLs in my News Sitemap that are older than 72 hours? We want only the most recently added URLs in your News Sitemap, as it directs Googlebot to your breaking information. If you include older URLs, no worries (there's no penalty unless you're perceived as maliciously spamming -- this case would be rare, so again, no worries); we just won't include those URLs in our next News crawl. To get the full scoop, check out the video! During my stint on the "How Google Works Tour: Seattle", I heard plenty of questions regarding News Search from esteemed members of the press, such as The Stranger, The Seattle Times and Seattle Weekly. After careful note-taking throughout our conversations, the News team and I compiled this presentation to provide background and FAQs for all publishers interested in Google News Search.